Fall is a great time to hit up the local lakes and catch some nice trout or char as they fatten up before the winter freeze. Stop by the store to check out our great selection of lake gear. Babine Lake is open for Sockeye until September 15th, with a daily limit of one. What a beauty way to end the season! This past weekend we saw amazing weather out on the coast as most anglers took their final trip of the season. The Coho fishing was phenomenal with the majority of fish coming in the 12-15lb range. Spoons were the ticket this weekend and we saw the Coyote 4.0 blue Live Image spoon being the hottest spoon of the weekend. It was even outperforming anchovies! Out of Rupert, the Coho fishing continues to be good and steady. The Northern Coho that I've been talking about in my past few reports will start showing up soon. Douglas Channel fishing was lights out this past weekend. It seemed like everywhere we went there was a ton of Coho around. In a total of 4 hours salmon fishing we landed over 20 fish! We should see the Coho around the Douglas channel area for the next month or so and fishing should remain good. Halibut fishing this past weekend was a little tough for us down the Douglas with only 1 fish boated. Other anglers had more success as the weather was good allowing anglers to get way out to those offshore hali holes. Unfortunately the recreational halibut fishery IS NOW CLOSED with the total allowable catch quota being reached as of Sept 6th @ midnight. Crabbing and prawning continues to be good and should remain this way into the fall. Find a salmon bearing river or stream and put a trap down in front when you’re looking for Dungeness. They will be waiting for the salmon carcasses and will be stacked up in front of the fresh water. As this was the last trip for us, this will be my last report for the season. Don't worry though, steelhead season is upon us so Alex will keep you up to date on everything freshwater. As always, before your next fishing trip, head down to Oscars and let them get your geared up to catch the big one! Steelheading is just starting and Sockeye fishing and Chinook fishing is closed. There are a still quite a few old Chinook at the top end of the river, but you are not allowed to target them, let them spawn. Water clarity is great, levels are good although a bit low. Still quite a few Coho being caught. 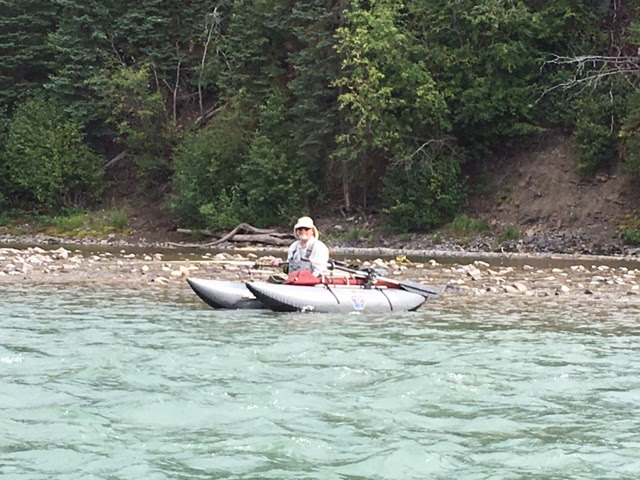 Trout Creek has been fishing pretty good, and the best of luck is usually in the morning. Steelheading has been tough- when we say tough we mean the actual catching, because the rest has been wonderful! The weather has been great and as much as it is nice to catch fish, it sure is nice to be on the water on a nice fall day! River is in good shape, fishing has been tough for most, but there are a few fish around. Be aware of the Grizzles! River is very low and clear but Coho fishing has been excellent in the early morning. Set your alarm and hit the river early! Pink, Chinook, and Chum fishing are all closed. Fishing has picked up! Coho fishing has been really good around Anderson Flats. There are still quite a few Sockeye being caught-this is open till the 15th. More and more Steelhead have been caught: this is great, means they are on their way up the Bulkley and Babine too!